LEXINGTON, Ky. (April 16, 2014) – The University of Kentucky Office of External Scholarships is proud to announce that political science junior and UK Women's Tennis Team member Grace Trimble, of Winchester, Ky., has been named a 2014 Truman Scholar and will receive $30,000 to conduct graduate work in areas of public service. Trimble, the only Truman recipient this year from Kentucky or a Kentucky college or university, is the 13th UK student to receive the honor from the Harry S. Truman Scholarship Foundation. "Grace is joining a small number of exceptional UK students honored with the illustrious Truman Foundation Scholarship," said UK President Eli Capilouto. "The entire UK family is extremely proud of her achievements in academics and public service that earned her this award. We look forward to all that she will continue to do on our campus and beyond." The Truman Scholarships are national awards given to college juniors who demonstrate outstanding leadership and are devoted to careers in public service. Recipients of the award are required to work in public service at least three of the seven years following completion of their graduate program. Trimble was among the 59 scholars nationwide selected by the Truman Foundation from 655 candidates nominated for the annual scholarship for graduate study. The scholars represent 52 colleges and universities from across the country. The last UK student selected as a Truman Scholar was Corinne Keel, who received the scholarship in 2008. In addition to the scholarship, scholars also receive priority admission and supplemental financial aid at some premier graduate institutions, leadership training, career and graduate school counseling, and special internship opportunities within the federal government. Recipients must be U.S. citizens, have outstanding leadership potential and communication skills, be in the top quarter of their class, and be committed to careers in government or the not-for-profit sector. The concept of service is very important to Trimble, who as a teenager founded and began operating a nonprofit organization. She is excited for not only the opportunities the Truman will afford her in the classroom but also in the community. "Through founding a nonprofit tennis and education program, my life has been forever changed," Trimble said. "It is through serving others that I have been able to find myself and my passion. It is through the kids in my program and the lessons I have learned from them that I am able to reach my own goals. I hope to use the platform I have been provided through the Truman Scholarship to take my program to a new level and reach thousands more." UK Athletics Director Mitch Barnhart was not surprised Trimble impressed judges of the prestigious Truman Scholarship. "People are grateful Grace crosses their path because she gives of herself in more ways than I can describe," Barnhart said. "She has had a tremendous influence on her team, other student athletes and the community. Grace has represented the University of Kentucky at the highest level in every aspect of her college athletic career. In every facet of life, she excels not for her benefit but for the benefit of those she encounters." Trimble, the daughter of Morton and Robin Trimble, will join the other 2014 scholars from across the nation for a week of programming and a special awards ceremony in May at the Truman Library in Independence, Mo. A Chellgren Fellow, Trimble has advanced her studies in politics, nonprofits and public service as an undergraduate researcher at UK. As part of her research, Trimble had the opportunity to design and implement a survey to gauge the effectiveness of her nonprofit organization, Lexington Tennis Club Smart Shots. Through the surveying process, she has been able to take steps toward improving the overall effectiveness of Smart Shots. 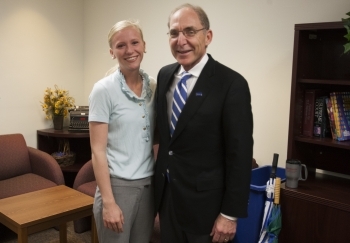 Trimble counts her research advisor among the mentors at UK who not only influenced her work but also her career goals. "Dr. Clayton Thyne, my PS 395 professor, has changed my trajectory as a student and future professional. He has taken me under his wing and provided me with the opportunity to pursue my passion for public service as a student," said the Truman Scholar. Trimble is not only a competitor in the classroom but also on the court playing for the UK Women's Tennis Team. Trimble, who was just named to the 2014 Southeastern Conference Community Service Team, credits her coaches as other important mentors in her life. "My tennis coaches Joanne Wallen and Carlos Drada have enabled me to pursue my passion on and off the tennis court. They have invested in my life enabling me to step out into the world and invest in others." 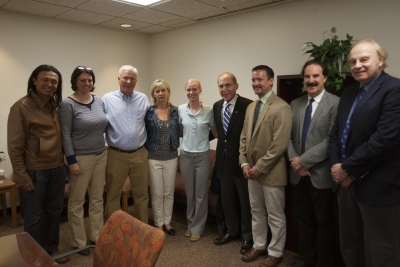 Certainly, Trimble also is grateful for her family's support in helping her pursue her goals. "My family is my foundation through which I propel myself to heights I never could have imagined." After completing her Truman Week programming in May, Trimble will intern with the U.S. Tennis Association (USTA) this summer. The USTA has recognized her with many national awards through the years including the National Arthur Ashe Essay contest award and a Dwight F. Davis Memorial Scholarship, as well as asking Trimble to be the keynote speaker at the U.S. Open's Opening Night Gala in 2011. Upon completion of her bachelor's degree in May 2015, Trimble will use her Truman Scholarship to pursue a Masters in Public Administration with an emphasis on nonprofit management. Candidates for the Truman Scholarship were nominated by 294 different colleges and universities. Selection panels, typically comprised of a university president, a federal judge, a distinguished public servant and a past Truman Scholar, interviewed finalists from a three to four state region and elected one scholar from each state and one at-large scholar from the region. A complete listing of the 2014 Truman Scholars is available online at www.truman.gov. The Truman Scholarship Foundation was established by Congress in 1975 as the federal memorial to the 33rd president. The foundation awards scholarships for college students to attend graduate school in preparation for careers in government or elsewhere in public service. Activities of the foundation are supported by a special trust fund in the U.S. Treasury. There have been 2,965 Truman Scholars selected since the foundation began. Students interested in applying for the Truman Scholarship should contact Pat Whitlow, director of the UK Office of External Scholarships (OES). Part of the Academy of Undergraduate Excellence within the Division of Undergraduate Education, OES assists current UK undergraduate and graduate students and recent alumni in applying for external scholarships and fellowships funded by sources (such as a nongovernment foundation or government agency) outside the university. These major awards honor exceptional students across the nation. Students who are interested in these opportunities are encouraged to begin work with OES well in advance of the scholarship deadline.